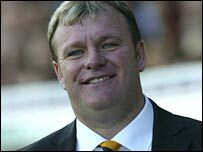 Boston United chairman Jim Rodwell says no approach has been made by Darlington for manager Steve Evans. Speculation has linked Evans with a move to join up with former Pilgrims chairman Jon Sotnick after the Quakers suspended their boss Dave Hodgson. Sotnick is now chief executive at fellow League Two side Darlington. Evans told BBC Radio Lincolnshire: "I told the fans a few weeks ago that I wasn't going to Darlington and nothing has changed since that time."